Choose from two ways to easily track your Crocs.com order. 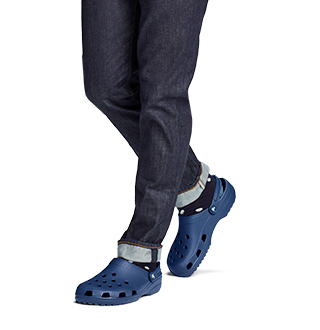 Visit Crocs.com and select ”Sign In” from the top navigation bar. Sign In. Enter your registered email address and password and click Sign In. Under Order History, select your order number. In the right column of the Order Details page, find Track Shipment and click the blue tracking number. 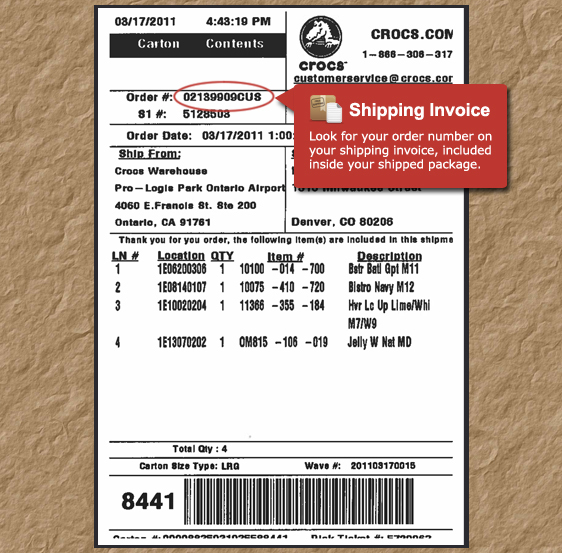 Your tracking information will display with the estimated delivery date and package travel history. Click Order Status in the footer at the bottom of the home page. Order Status. Enter your order number and your billing last name. (Be sure to capitalize the CUS at the end of the number. For example: 00123456CUS.) Click Go. Contact Customer Service at 1-866-306-3179 or by email. You may cancel an order within 30 minutes of submitting. Orders placed using Crocs Gift Cards cannot be cancelled. For information about refunds or exchanges, please see our return instructions. Registered Users: Sign In to view your order receipt. Click the "cancel this order" link marked in red. If you do not see the cancel link, your cancel window has expired. Please wait to receive your package and then follow the return instructions. Contact us by phone to speak directly to one of our Customer Service representatives. Our phone number is 1-866-306-3179. Contact us by sending an email to customerservice@crocs.com. One of our Customer Service team members will get back in touch with you within 48 hours. Enter your name, email address, question and order number (if available) and click Chat Now. At this time we do not accept any other forms of payment. For more information about Crocs Gift Cards, please see gift card terms. Crocs™ coupon and promotional codes need to be applied in the cart prior to checking out. You can apply your coupon or promotional code in the "Promo or Coupon Code" field on the left side of the cart, under the list of shoes being ordered. Make sure to hit the apply button in order to ensure your coupon is applied appropriately. Once applied, you will see the price change in the cart. Looking for a coupon code? See our latest offers. We are not able to apply coupons once orders are placed. We do want you to enjoy your discount at Crocs.com and hope that you'll hold on to the coupon code for a future order. If your coupon code is valid for a short time, you can watch for new promotions and discounts by signing up for our newsletter. Coupon codes are often case sensitive, so be sure you're entering it in the proper case. Also, double-check to ensure you're typing the numbers and letters in the correct order. Most coupon codes cannot be combined with other coupon codes or site offers and promotions. Your coupon code may have expired. If the coupon code has expired, you'll receive an "Expired Promo Code" error message under the coupon and promo code box. Some coupon codes are valid only on specific styles and will not work with non-qualifying styles. You can check coupon or promotional exclusions with the details link once the coupon is applied in your cart. Yes, we price match! If an item you buy on our website drops in price within 14 days of your original purchase, we will honor the new online price at your request. The price adjustment will be issued with proof of purchase via a refund back onto your original form of payment. This price match offer is only valid on purchases made on Crocs.com and we will only match prices listed on the Crocs website. Crocs reserves the right to change this policy at any time. If your Product develops a defect while under warranty, you should contact Crocs as indicated below, and any defective Product, at Crocs’ instruction, may be returned to the below address for an exchange or refund with receipt or proof of purchase. If you do not have a receipt or it is past the 90-day window, we cannot replace your item, but we would love to help you find a new pair. This warranty gives you specific legal rights, and you may also have other rights which vary from State to State. 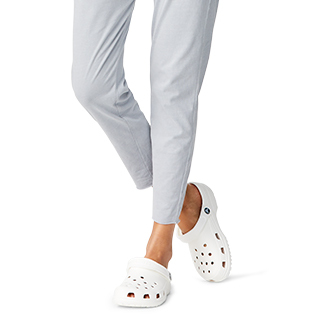 If you received Crocs as a gift, we'd be happy to exchange it if the product is unworn and doesn't quite work for you. You can call us at 1-866-306-3179, email us to get a gift exchange set up. We will need to know the style of the footwear that you will be replacing, the reason for the exchange, and your email address. When your footwear is returned, we will be happy to send you a replacement pair. If you’re not completely satisfied and comfortable with your purchase, you can return unworn items within 45 days for a refund. Click here to initiate your return and for additional instructions. If there is a quality issue with your item, click here for our warranty policy. Items marked “Final Sale” cannot be returned or exchanged and are not subject to price adjustment. Go to your Order History and click Order Details. Click Return Item(s) and follow the prompts to complete your return. Choose method of return during your return process. UPS Pre-Paid Label*: Attach the provided mailing label to the outside of the package with the barcode visible, and be sure the package is free from old labels. *Please note: We will deduct $7.50 from your refund if you use our label. Pay for your own: Choose this option during the return process and print the label provided. If sending the package without the label please make sure to write the Return Number on the package. Return to store: Choose this option during the return process to find the nearest Crocs Store to return your item. Return your package to any UPS drop-off location. Click here to find the location closest to you. After we receive the package, your refund should be processed within 10–14 business days. Please note that it may take additional time to post your account depending on your bank or financial institution. Please retain the tracking number of your return shipment. Crocs is not responsible for returned packages that are not received by our facility. You may return your Crocs.com purchase from home or at an official Crocs-owned retail store or kiosk for a refund, or you may exchange by mail. 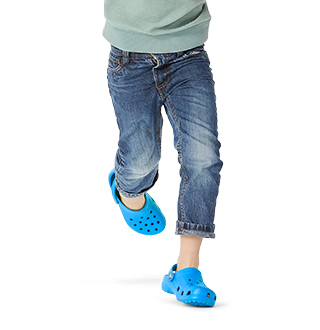 Items from Crocs.com orders may be returned to a Crocs store for up to $250 per order. Crocs-owned stores can only refund PayPal orders in the form of a Crocs gift card. If you choose to take your return to a Crocs-owned retail store or kiosk for an exchange, please call the store as stores may have different styles or sizes. For a complete list of Crocs Owned Stores Click here. After you mail your package, your refund should be processed within 10–14 business days. Please note that it may take additional time to post your account depending on your bank or financial institution. Please note: We will deduct $7.50 from your refund if you use our mailing label. Or, if you prefer, you may pay to ship with a carrier of your choice. We do not currently replace straps, rivets, or liners. If you believe there is a quality issue with your item, we will make it right. Items may be returned for an exchange or refund within 90 days with receipt or proof of purchase. If you do not have a receipt or it is past the 90-day window, we cannot replace your item, but we would love to help you find a new pair. Delivery times to AK, HI, PO Boxes, PR, VI, or APO/FPO/DPO will take longer. See checkout for details. For a limited time and for eligible orders of $34.99 or more, Standard shipping is offered for only $3.99 - this offer is subject to change at any time and without notice. Crocs, Inc. and Soles4Souls have partnered to provide the opportunity to recycle your lightly worn Crocs shoes, so that they can be used in a "second life." Once Soles4Souls receives your shoes, they will clean them and donate them to people who need shoes in impoverished nations around the world. 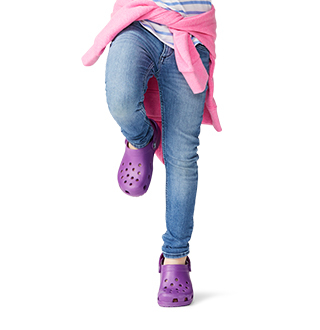 Certain Crocs™ shoes offer CrocsLock™ tread, which provides slip-resistance that meets or exceeds industry standards. Please note that while they are slip-resistant, they are not completely slip-proof. Please use general caution, as you would in any other shoe. Crocs shoes made entirely of Croslite™ material do not contain latex. Crocs shoes that are not made entirely of Croslite™ material may contain other products within legal limits. See individual product pages for details.